Nestled in the trees with a view formerly reserved for our feathered friends is the Tree house cabin. Secluded within the River of Life Farm's 350 acres, the Tree House cabin has a great overlook of the North Fork from its private deck. 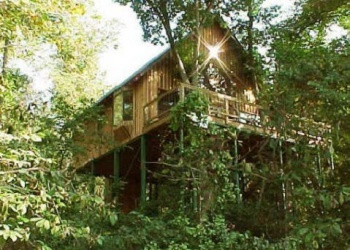 It's the perfect secluded cabin for a Missouri hiking vacation or fly fishing trip. Access to the "miracle mile" of rainbow trout fishing, the finest in the Missouri Ozarks, is included. The River of Life Farm grounds and next door Mark Twain National Forest offer numerous hiking and nature sightseeing trips for all skill levels. The sound of the river from your deck will help you forget about all your troubles and relax at Missouri's finest. Beautifully custom crafted, the Tree house cabin features native red cedar woodwork throughout the cabin. All the modern comforts of home including a fully equipped kitchen, microwave oven, and air conditioning are there for your needs. It's the perfect Missouri secluded cabin for your trout fishing getaway, Ozark hiking vacation, canoeing/floating trip, or even a honeymoon. The Tree House cabin sleeps up to 6, with a master bedroom (queen size bed) and a loft bedroom (one queen and two twin beds).